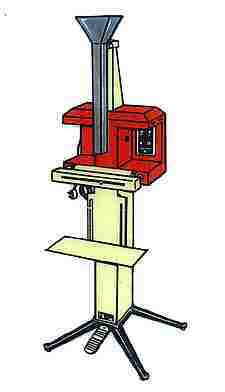 This is a foot pedal operated machine. The packing film is loaded on a shoot which acts as funnel for filling operation. A pre measured quantity of product to be packed is filled into the pouch through funnel and heat sealed cutting blades provided - separates two pouches from each other. Impulse / Direct heat sealing system as per customer's requirement. The machine works on same principle as of Fill & Sealing Machine(Pedal type) but for pneumatic operation of the sealer, which makes the operator to work on the machine effortlessly.